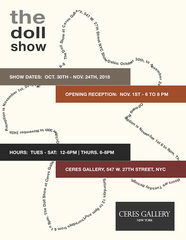 Ceres Gallery presents the doll show, with work by Roslyn Rose, Kailyn Meeks, Jo-Ann Brody, Jody MacDonald, Gwen Charles,Heidi Kumao, Charlann Meluso, Karmimadeebora McMillan, Ella Hilsenrath, Liz Hamilton Quay, Erin Rice, Aliza Augustine, Piper Smith, Fulvia Zambon, Halona Hilbertz, Janet Cooper, Susan Kaplow, Lily Zane, Hagar Fletcher, Carmella Gullo, Juliet Martin, Gailene St. Amand, Janis Pinkston, Patricia Dahlman, Pam Cooper, and Alexandra Wilde Langley. These artists use a variety of materials, techniques, and styles to create images and sculptures that they call dolls. They delve into the myriad aspects, uses, and attributes of dolls. “My commitment to the work I create revolves around the way doll-like figures allow us to explore our need to both give and receive comfort.” Ella Hilzenrath, “Dressmaking for Dolls, Paper Dolls and Doll Houses were a big part of my childhood so I find it unsurprising that they are go to images and structures in my work about the social issues with the children of today.” Pam Cooper, “Though each figure begins with a photographic image of my face I do not consider the work to be a collection of selfportraits but rather a series of performative roles in which I've been cast.”Jody MacDonald, “The adornment of the sensual female vessel through delicate embroidery, beading, and lace suggests that growth can emerge and live in harmony with the scars; albeit, the scars become their own form of beauty.” Elizabeth Quay, “Dolls collect auric energy from their maker.” Gailene St. Amand. “The puppets in my stop motion animations display neurotic behaviors and difficult emotions which gives them an unexpected and uncanny presence, as if they are acting of their own accord.” Heidi Kumao, “Dolls are a way to celebrate the human form and to revere our vulnerability.” Janet Cooper, “Dolls contain our stories, amass our emotions, and know our secrets, yet they are capable of telling stories as well.” Kaitlyn Meeks, and “The dolls I paint are a reminder of the not so distant past where slaves were not allowed to do anything creative, because of that the dolls I paint were made anonymously, its important to me that their stories are told.” Karmimadeebora McMillan, and “Dolls, small figurative sculpture, fertility goddesses, figures of compassion and love, translated into friendly forms.” Jo-Ann Brody.